Creating a stable emulsion of oils/fats with water can be a real challenge. Following a successful collaboration with one of our customers, Actikem has commissioned and installed a new Gaulin homogeniser unit offering customers increased capacity and more stable emulsions. In most applications, these emulsions consist of a fat/oil blended into a water. The Gaulin homogeniser is a very high pressure, multi-piston pump with a small, variable sized orifice. 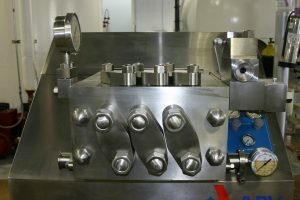 As product is forced through the orifice, the resultant shear forces break down fat/oil globules to sizes small enough to prevent (or at least considerably delay) the natural separation of a single component from the rest of the emulsion. While specialist equipment such as the Gaulin Homogeniser directly benefits the stability of the mixing process, emulsification can be taken a step further. Actikem offers particular expertise in the field of surfactants and the combination of Actikem's knowledge with the new homogeniser unit can deliver real benefit to your processes. Actikem offers a confidential contract chemical manufacturing, processing and repackaging service to most industries in the UK and Europe. To find out more email sales@actikem.com or call us on 01925 593900.